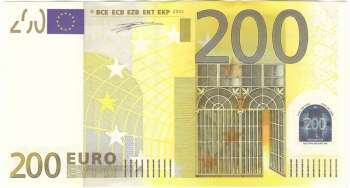 The two hundred euro note (€200) is the second-highest value euro banknote and has been used since the introduction of the euro (in its cash form) in 2002. 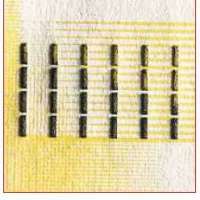 The two hundred euro note measures at 153 millimetres (6.0 in) × 82 millimetres (3.2 in) with a yellow colour scheme. 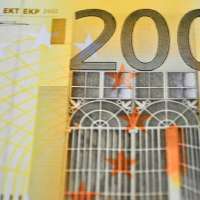 All bank notes depict bridges and arches/doorways in a different historical European style; the two hundred euro note shows the Art Noveau era (between the nineteenth and twentieth century CE). 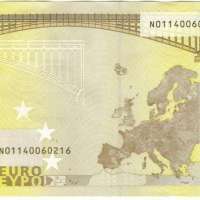 The European Blind union was consulted on the design of the banknotes and consequently four features were incorporated into the banknotes to help the blind and visually impaired to distinguish between them. Each banknote denomination is of a different size – the higher the denomination, the larger the banknote, it has a dominant colour, with contrasting colours for "adjacent" banknotes (eg the €10 is red, the €20 is blue), it shows large, bold value numerals, it features raised print (also called intaglio printing), which makes the ink feel thicker in some parts the €200 and €500 banknotes include additional tactile marks near the edges.